It’s another round of Bake Along! 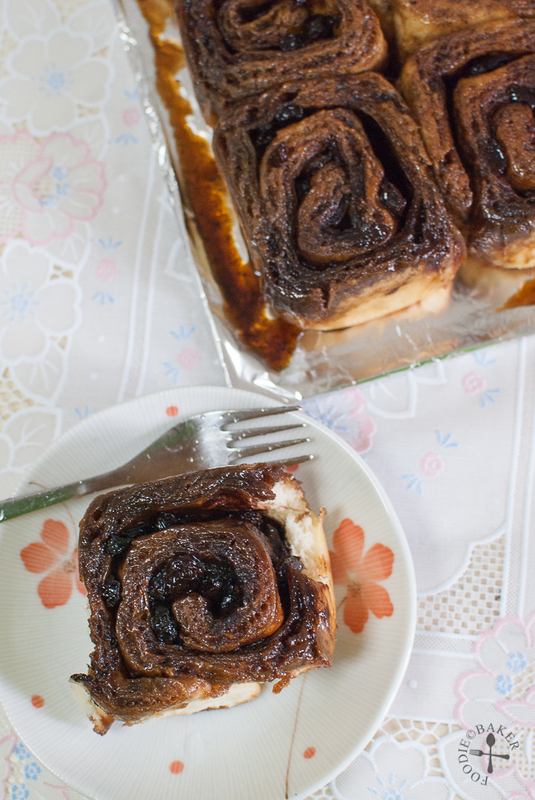 These cinnamon rolls are so sinful – they are not only filled with a cinnamon-sugar filling, but also topped with a maple-brown sugar syrup that makes them a stickily sweet and heavenly treat fresh from the oven! But somehow I lacked inspiration when taking photos of them – I just don’t know how to make them look as good as they taste! Unfortunately these rolls hardened on the second day and I had to pop them into the oven so that they will soften slightly. Does anyone know how to make home-made bread stay soft for at least 3 days? The only tip I know is to freeze them once they are baked then thaw them in a warm oven so they’ll become soft before consuming, but sometimes when I was rushing for time, I don’t have the time to wait for the rolls to thaw! I just want to grab-and-go… so if you have any tips on making bread stay soft at room temperature for a few days, do let me know! Thank you! As this post’s quite photo-intensive, I’m gonna head straight to the step-by-step photos! 1) Combine yeast, flour and sugar. 2) Add in one egg yolk. 3) Pour in warm milk, stirring immediately. 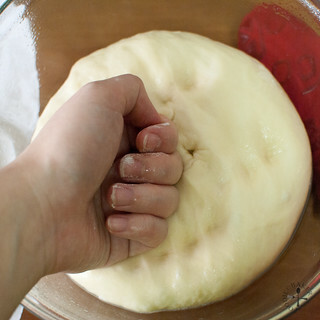 4) Knead until a smooth dough formed. Let rise. 5) Combine cinnamon filling together. 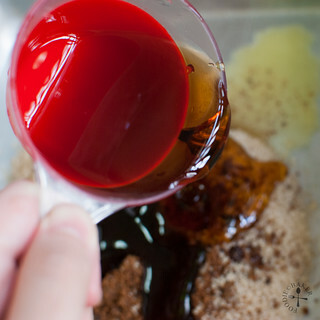 6) Combine syrup topping together in a baking pan. 7) Pour maple syrup all over. 8) Spread evenly on the bottom of baking pan. 9) Now the dough's doubled in size! 10) Punch it down a little. 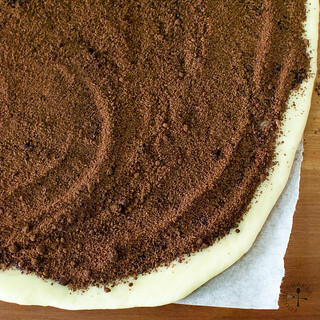 11) Roll the dough into a large rectangle. 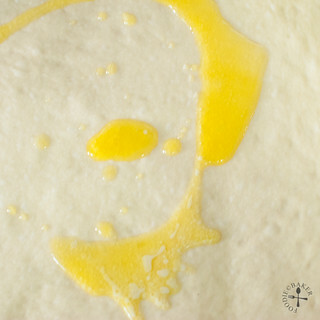 12) Spread butter all over the dough. 13) Sprinkle the cinnamon filling all over. 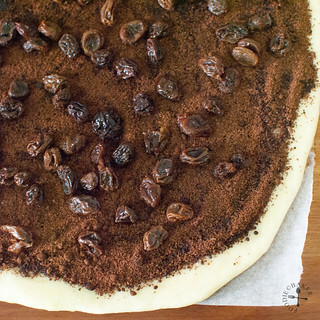 14) Sprinkle soaked raisins all over. 15) Here's what the cross-section look like! 16) Place the cut rolls in the envy lounge. 17) Let rise until double! 18) Bake until golden brown. Tip out the rolls out and serve warm! I’m submitting this to Bake-Along #49 hosted by Zoe from Bake for Happy Kids, Joyce from Kitchen Flavours and Lena from Her Frozen Wings! 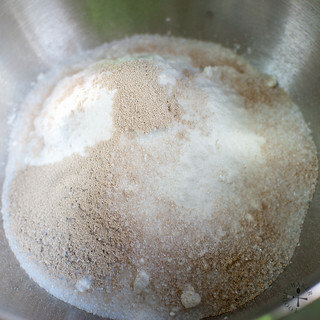 Dough: Combine 220 grams (1¾ cups) flour, sugar, yeast and salt in a large bowl. Stir to mix them together. 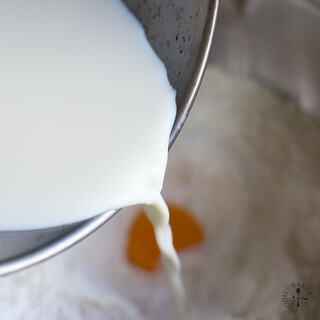 Stir in the warm milk, followed by the egg yolk until a rough ball of dough forms. 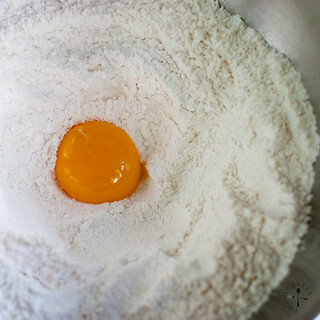 Knead the dough until smooth and elastic, adding more flour if necessary. 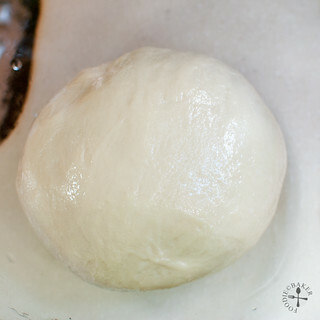 Roll the dough into a ball and transfer into a lightly buttered dish. Turn around to coat with butter. Cover with tea towel and let it rise in a warm place for 1½ hours or until doubled in size. 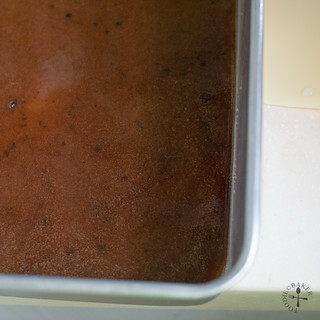 Syrup: While the dough is rising, combine the syrup ingredients (sugar doesn't have to fully dissolved) and spread onto the bottom of an 8-inch square tin or 9-inch round tin. 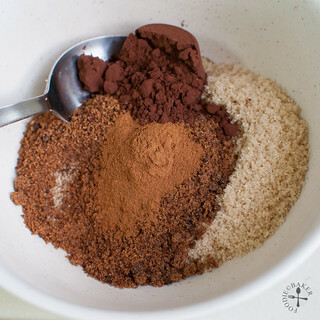 Filling: Combine brown sugar, cocoa powder and cinnamon together in a small bowl. Set aside. 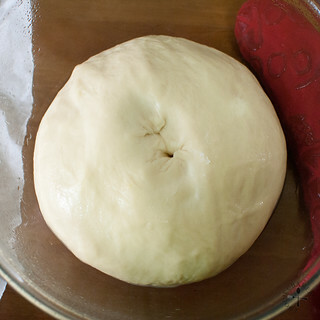 Assembly: Once the dough has risen, punch it down slightly. 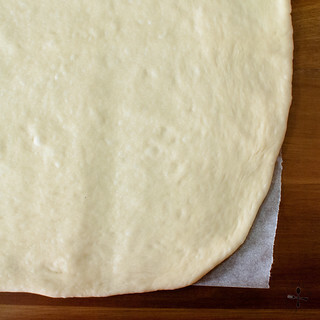 Turn it out and knead a couple more times then roll it out into a large rectangle 9 x 10-inch. 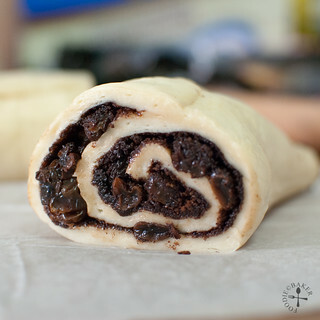 Brush the dough with 1 tablespoon of the melted butter (from the Filling ingredients), sprinkle the sugar-cocoa-cinnamon mixture evenly over the dough then scatter the raisins all over. Roll up the dough tightly and pinch the edges to seal. Cut the dough into 9 equal pieces and arrange them in the cake tin. Cover and let rise in a warm place for 1 hour or until doubled in size. Baking: Preheat the oven to 175 degrees Celsius. Brush the risen rolls with the remaining tablespoon of butter (from the Filling ingredients) and bake the rolls for 25 to 30 minutes until golden brown on top. Let cool on a wire rack for 10 minutes. Invert the rolls onto a serving plate and serve warm. Super Naggy: I kneaded the dough using my handheld mixer with a dough hook attachment. The dough was pretty sticky and heavy and since my handheld mixer overheats easily, I kneaded for 5 minutes, rest for 5 minutes, then continue kneading again. 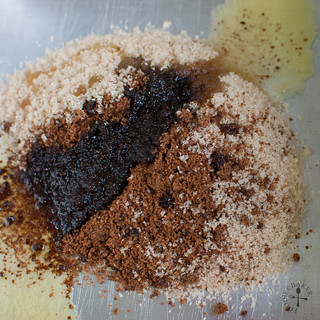 I used a mix of light brown and dark brown sugar (1:1) for both the syrup and the filling. I also felt that there’s too much syrup so I will use only 1/2 the syrup the next time I make this. your cinnamon rolls looks fantastic! Hi Alice, thanks for the tip and compliment! I guess it gives me more reason to bake home-made bread! Hi Jeannie, thank you! Can’t wait to see your bake! Hi Mary! Wish I can send some rolls to you, then your coffee will be able to make some friends 😉 Thank you very much, you have a great day too! Thank you so much! I’m very happy how these rolls turned out, only wish I can keep them soft longer! 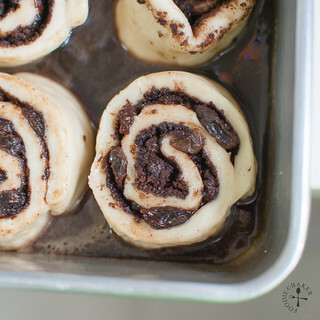 Sweet, gooey, cinnamon-swirled heaven! The dough looks perfectly soft, too. Seems like a fool-proof recipe alright. Hi Hannah, thank you so much! Yes it can be pretty messy eating them, haha! Ooh, I love sticky cinnamon rolls! My family always zaps the leftovers in the microwave…and I find a buttery dough (like brioche) seems to stay fresher longer. You seems to be too critical with yourself… I think you did a great job bringing out the deliciousness of these rolls. I’m in complete drool mood right now and I can’t get out of it. I LOVE how these came out. Delish! Wish I can send you one! Thank you so much! These look terrific! I haven’t had – or made! – a cinnamon roll in awhile, and now you have me craving them. I find if my rolls get a bit stale, a brief microwaving helps correct that. BTW, did you use skim milk when you made these? Full fat milk helps prevent things going stale (it the fat in the milk that does it). These look AMAZING! 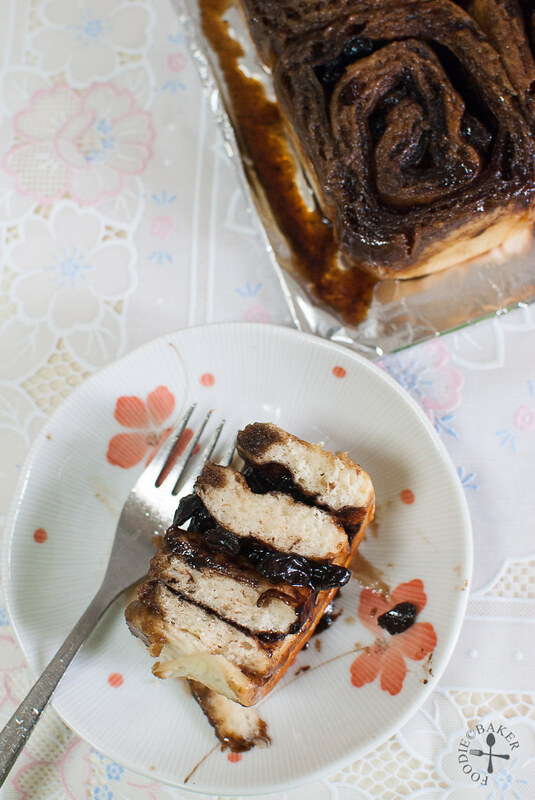 Cinnamon rolls are on my to bake list – I will have to try this recipe! I love your step by step photos! Hi Jasline, I have the same problem as you with most of my bread, so I am thinking of getting a bread machine just for kneading. I like that you added cocoa in your cinnamon rolls. Good job! Hi Lian! I want to get a bread machine too but not at the moment as I don’t think my mom can stand me getting anymore equipment… no space at home! Haha! Thank you very much! These rolls are delicious! Glad that you have given it a try! I guess that how the bread stays soft really depends on the recipe. Hi Averie! Haha even though I wash my hands everytime before I use the camera, bits of flour/dough/sugar/cocoa/i-don’t-know-what still managed to find their way onto the camera… haha! Glad the photos are helpful! base on what i learned from website, in order to let the bread soft is adding more sugar into the dough. else, using tangzhong method. anyway, did your bread past the gluten window test? Hi Thea! I learned the gluten window test from youtube and I’m not sure if I did it correctly, but light managed to pass through the thinned dough so I thought it’s kneaded sufficiently already… Maybe I should go for some bread baking class and learn more! Too little experience haha. 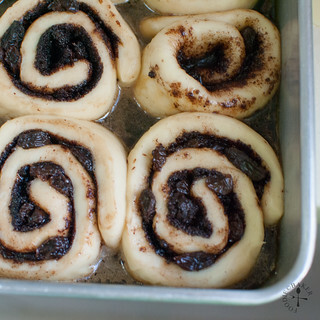 The cinnamon filling on these buns looks so incredibly great! Gosh – i bet they smelled heavenly! I am bookmarking this recipe! Thanks so much! Hi Shashi, thank you very much! I’m glad you like the recipe! Yes I couldn’t wait to eat them when they’re out of the oven! 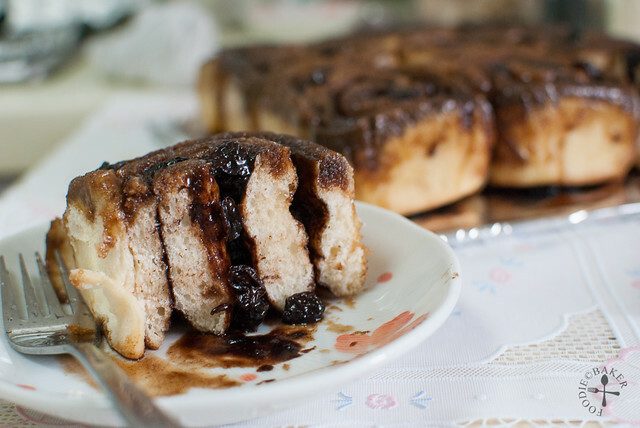 These cinnamon buns are stunning! Love festive cinnamon aroma! Hi Angie, thank you! Agree, cinnamon has such a wonderful aroma! 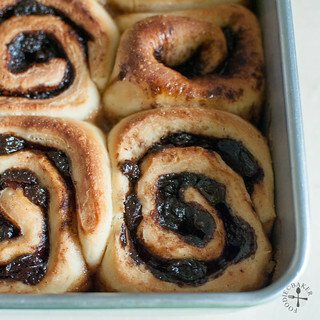 Your cinnamon rolls look so tempting!